Line S - Grand Street Shuttle (line letter S is used by all shuttle lines) in New York's subway for the class R-46 subway train. This temporary shuttle line goes between Grand Street and West 4th Street/Washington Square on Manhattan. This temporary shuttle line was only operative from the summer of 2001 and until the beginning of 2004 during the Manhattan Bridge reparation works. 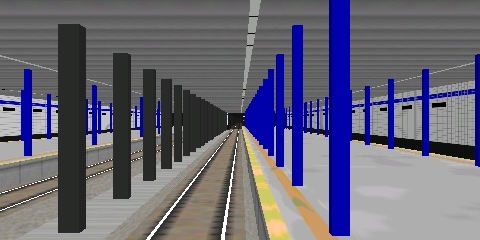 During that time, the line had the simulated route from the end of 2001 and later. The creator's web site www.nyctba.com has disappeared from the Internet long, long ago.